Women’s roles in the ongoing Egyptian anti-government uprising have captured the attention of bloggers and citizens spreading information on social networking sites. The massive number of protesters taking to the streets demanding government reforms has created a tipping point for women’s civic participation in a country where it is risky and dangerous to demonstrate against the authorities. Their efforts have had limited coverage in the mainstream media. In “Women Are A Substantial Part of Egyptian Protests “, blogger Jenna Krajeski writes that the turnout on the first day of the protests (January 25, 2011) included an unprecedented female attendance. The grassroots nature of the organizing seemed to inspire a sense of safety. So why are women so much more involved in this protest, called “The Day of Anger,” than in previous demonstrations against the Egyptian government? The Facebook-initiated groups are unaffiliated with a major opposition group. These protests also seemed safer. Organizers urged those attending to make it a peaceful one, and this became a rallying cry in some areas of the city on Tuesday. Moreover, Egypt’s educated youth, men and women, were fed up with a government that had not changed at all in most of their lifetimes, and which cuts even the educated off from any opportunity. And then there was Tunisia. Suddenly, attending the protest seemed not only worth the risk, but capable of inciting real change. The following YouTube video The Bravest Girl in Egypt posted by iyadelbaghdadi  features a young woman voicing her dissent against the Mubarak regime. Her words are subtitled in English. Daily Beast  journalist Mike Gilgio  writes that while it is not uncommon for women to be sexually harassed during public demonstrations in Egypt, this time around men were behaving in a more respectful manner towards women in what has been dubbed the Purity Protests  – where the idea of rallying around a unifying struggle against The State is more important than gender-based conflicts. Nour El Refai  also echoes the idea of women and men as allies in his blog post “Men and Women Equal in Peaceful Protest Against Mubarak “. The unifying struggle also includes people from diverse walks of life. 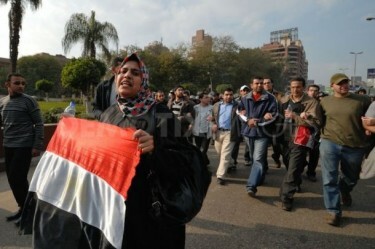 For the first time, Egyptians from all walks of life with different socio-economic backgrounds have joined the protests. Night after night, women and men have defied the government imposed curfew in Cairo, gathering in Tahrir Square, aka Liberation Square. A “Million Person March” towards the presidential palace is planned for tomorrow and a nationwide strike planned for Wednesday. 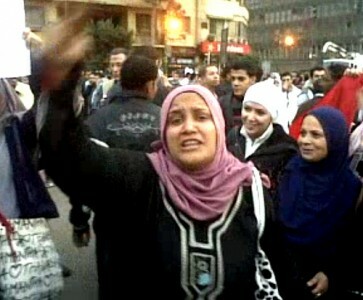 Egyptian civilians say they won’t stop protesting until President Mubarek steps down from office. And women in Egypt will be advocating for justice too. But when the media doesn’t show images of women involved, it appears as if they aren’t entrenched in rallying revolutions; they are written out of history. Women's participation is being documented through social networking sites, such as the Women of Egypt Facebook page  created by Barcelona-based Leil-Zahra Mortada . As of January 31, 2011 at 6:00 pm US Eastern Standard Time (EST), the material on the page included four albums with more than 130 images portraying women of varying ages, including some dressed in burqas, others wearing head scarves and some in more western attire. A common theme is an expression of anger and confrontation with the police. A number of these photographs are also making the rounds on photo-sharing websites. Twitpic  users Kardala , Farrah3m  and sGardinier  retweeted some of the images of the women protesters, whilst photo-sharing applications Plixi  and Picasa  were also utilized for similar purposes. The blogs Subterfusex  and Seilo@GeekyOgre  are also circulating the images. Independent photographer Monasosh  posted photographs of the women protesters on Flickr.